Nabih Berri, the speaker of Lebanon's parliament, has distinguished himself as both one of the most reviled of Lebanon's militia elites (even among fellow Shi'ite Muslims) and the most loyal of Syria's Lebanese allies. The presence of this figure atop the political hierarchy of Lebanon's Second Republic is symptomatic not of his own autonomous influence, but of Syria's absolute power over the Lebanese political system. Berri was born on January 28, 1938 in Sierra Leone, the son of Lebanese immigrants who, like many Shi'ites, moved to West Africa to seek financial opportunities. He returned as a child to his family's hometown of Tibnin, where he received his primary education, and continued his secondary education in Makassed and the Ecole de la Sagesse in Beirut. He studied law at the Lebanese University, where he established himself as a well-known political activist and rose to become student body president. After receiving his BA in 1963, Berri continued his studies at the Sorbonne in Paris. During the 1960's, Berri is known to have joined the "Arab Nationalist Movement" (Harakat al-Qawmiyyin al-Arab). Despite his political ambitions, Berri was sidelined by the traditional Shi'ite establishment, headed by then-parliament speaker Kamel al-Asa'ad, who refused to let Berri run on his electoral list in the 1968 and 1972 elections. Berri developed an acute hatred of Asa'ad that would reemerge during the war. In the early 1970's, Berri worked as a lawyer for General Motors (in Beirut). Berri lived in Detroit from 1976-1978 along with his first wife (a cousin of his). Berri also served as Attorney for Musa al-Sadr's Amal movement during the 1970's. After Sadr's disappearance in 1978 while on a trip to Libya, he returned to Lebanon to stake his claim for leadership of Amal. After Hussein al-Husseini's brief tenure as leader of Amal, Berri took over in April 1980. Between 1979 and 1982, the Amal movement was involved in fierce fighting with the PLO groups. Following the Israeli invasion of Lebanon in 1982, the Amal movement, along with the other Syrian-controlled Lebanese groups, were used by Damascus to drive U.S.-led multinational forces out of the country, weaken the Lebanese state and force it to abrogate the May 17 Agreement between Lebanon and Israel. Berri's quest to join the political establishment received a boost on February 6, 1984, when his militia participated in driving the Lebanese army out of West Beirut. As a result, then-president Amin Gemayel abandoned his longtime alliance with Asa'ad and started dealing with Berri, thus anointing him the strongest leader in the Shiite community. Later that year, Berri was appointed Minister of State for the Rebuilding of South Lebanon. He was later appointed Minister of Justice, Electrical and Hydraulic resources. In the mid-1980's Damascus relied heavily on Berri to counter the remilitarization of Palestinian refugee camps by Arafat's Fatah movement. In May 1985, Amal fought a two-year bloody war with the pro-Arafat Palestinian camps in Beirut and south Lebanon, indiscriminately killing thousands of people. "There must be integration with Syria, by means of actual agreements in the economic, security, military, political, information, and educational fields." In September 1985, Berri and two other pro-Assad militia leaders (Walid Jumblatt and Elie Hobeiqa) signed the Syrian-brokered Tripartite agreement that contained lengthy and detailed provisions calling for "complete and firm coordination" between Syria and Lebanon on "all issues--Arab, regional, and international." The Lebanese Army was to be "rehabilitated with Syrian assistance" and instilled with the capability of "distinguishing the real enemy from the real friend." The public outcry among Lebanese Christians (and the equally fierce, if less public, opposition of Sunni Muslims) led President Gemayel to reject the accord. Berri's increasingly autocratic tendencies and subservience to Damascus led to a dramatic decline in support for Amal within the Shi'ite community. Hasan Hashim, a charismatic, popular figure who served as Berri's deputy, resigned in 1986 to protest his "undemocratic" behavior. Top military commanders such as Mustafa al-Dirani, Aql Hamiyyah, and Zakariyya Hamza also abandoned the militia. Meanwhile, the rival Shi'ite Hezbollah militia proved to be more adept than Berri in recruiting new members. The net result was to make Berri even more dependent upon the Syrian regime. In fact, fearing for his own safety following skirmishes with other groups, Berri left the country and took refuge in Damascus. In early 1987, Berri made a stupendous blunder by ordering his militia forces into action against Druze and other pro-PLO militia forces entrenched in West Beirut. The tide quickly turned against him. Within five days, the headquarters of Amal in the Murr Tower were overrun, the PSP captured the Hamra district, and two detachments of Amal militiamen were cut off and surrounded. On February 22, 1987, Syrian forces stormed into West Beirut to prevent Amal's complete defeat, closely followed by Berri, who had spent nine months in exile in the Syrian capital. Berri soon turned his attention to Hezbollah, which over the course of the next several months proceeded to drive Amal forces out of several positions in the southwestern suburbs of Beirut. Again, Syria intervened to save its militia proxy, calling on both sides to withdraw from the contested areas. Hezbollah, which had lost twenty-three fighters in clashes with Syrian forces in West Beirut earlier in the year, wisely complied with the order and Syrian forces occupied the area. On November 20, 1992, Berri was "elected" Speaker of the Lebanese parliament following a rigged election that was boycotted by eighty seven percent of the Lebanese people. As the head of the highest Shiite post in the Lebanese regime, Berri continued to be the main Syrian ally in Lebanon. He has consistently provided a political cover for the Syrian activities in the country. He has played a crucial role similar to a Vichy-style administrator in implementing the wishes of the Syrian occupiers. Under the reign of the Taif regime in which Berri played a major role Lebanon was turned into a satellite state. Seventeen major agreements were "signed" between Syria and its puppet regime in Beirut that tied Lebanon's government and economy to those of Syria. Berri's main concern was to maintain his job and to continue plugging his own supporters in the government's bureaucracy. Once in power, he behaved exactly like the feudal leaders of the past which he used to criticize. 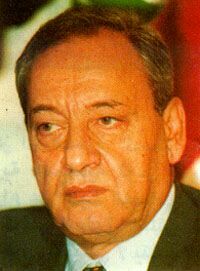 In 1995, Berri opposed a constitutional amendment to extend the presidential term of Elias Hrawi. When Syria decided otherwise, Berri suddenly changed his mind and led the effort of extending Hrawi's term three more years. Berri's recent effort to mediate between Syria and Maronite Patriarch Nasrallah Sfeir is widely regarded as an attempt by Damascus to dilute the rising tide of opposition to Syrian occupation. Most Lebanese doubt that Berri would initiate any move without getting prior clearance from Maj. Gen. Ghazi Kanaan, the de-facto colonial administrator of Lebanon. Like many other militia leaders, Berri used his control over various economic installations to derive enormous sums of money during the war years . The most notable case involved the Zahrani oil refinery. Berri, in collaboration with the now-deceased Jamil al-Sa'id (the former dictator of Sierra Leone, half Lebanese and half African, who embezzled an enormous sum of money from his homeland and fled to Lebanon, where he acquired a passport with Berri's help), received a substantial cut from every gallon of oil refined and sold from Zahrani (money that should have gone into the coffers of the Lebanese government. Berri extorted a huge amount of money from Rafiq Hariri when the latter was prime minister between 1992 and 1998. Sources in Lebanon told MEIB that Syrian officials were extremely astonished when Hariri revealed to them how much money Berri was able to extort from him every time there was a government crisis. Nabih Berri, his current wife Randa and his wife's sister, Samira Assi, have been making commissions on everything involving south Lebanon and the Shiite community. Samira Assi made a fortune by getting a contract from Libyan leader Moammar Qadhafi to print one million copies of Qadhafi's "Green Book" - so much for the blood of Imam Musa al-Sadr, the founder of the Amal movement, who was liquidated by none other than Qadhafi himself. Berri has proved to be a political survivor and a shrewd politician. But this successful political career came as a result of his collaboration with the Syrian occupation army. 1 Richard Augustus Norton, Amal and the Shi'a: Struggle for the Soul of Lebanon (Austin: University of Texas Press, 1987), p. 68. 2 According to a 1996 study by Judith Palmer Harik of the American University of Beirut, Aoun ranked higher than Berri and all other politicians among Shi'ite respondents asked to name their most preferred Lebanese leader in an open-ended survey. See. Judith Palmer Harik, "Between Islam and the System: Popular Support for Lebanon's Hizballah," The Journal of Conflict Resolution (Vol. 40, No. 1), March 1996, p.52.